If you have developed a doll collection or are just starting to collect dolls, you will no doubt want to protect it for future enjoyment. The following information may help you to do just that. 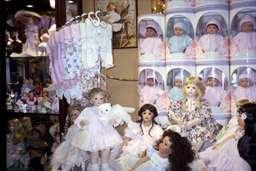 Dust & dirt accumulation can damage fragile doll clothes fabrics and doll wigs, and discolor some types of doll bodies. The ideal way to keep your dolls clean is to display them in as dust-free environment as possible like a glass case. We have however found that even in a glass case dust will find its way in so dust often. We remove our dolls from their cases and either dust them with a large good quality paint brush or vacuum them using a vacuum that is used for computer keyboards. The vacuum for computer keyboards is quite cheap to buy, get the one with a soft brush attachment. These are really great tools ! The point is that we use a very, very low suction vacuum for cleaning to avoid damage. Avoid repeated handling of your dolls with your bare hands and when you must handle them, please wash your hands even though they may be clean already. The natural oils and perspiration from our hands will accumulate on dolls over time and do damage. Keep your dolls out of extreme temperature and/or humidity changes. Dampness can cause the top layer on composition dolls to lift away. Not to mention that heat and dampness cycles can cause mildew or other problems to occur that will damage clothes and wigs. Keep all dolls away from fireplaces and heating radiators . Keep ultraviolet light away from dolls! Sunlight is a dolls worst enemy, it can fade and damage doll clothing and materials used to construct some dolls. If you display your dolls near sunlight, pay particular attention to how the sunlight enters the room during the day and throughout the year because the sun's angle changes all year long. You may be surprised to find that at times during the day the sun may enter the room so as to pose a threat to your dolls. For PLASTIC and VINYL dolls. Use a very mild unscented detergent that in greatly diluted in water. "DO NOT USE PRODUCTS THAT CONTAIN BLEACH OR AMMONIA". Always minimize the amount of liquid that you apply to the doll by using a cloth that is slightly wetted with your detergent and water mixture. Rub softly any soiled areas and then follow that up with a clean cloth slightly wetted in clear water to wipe away your cleaning residue. If you must do cleaning in small areas such as between fingers and toes or the like then use a q-tip, or toothbrush for those areas.